5. Alfred Edward Mathews (1831-1874). 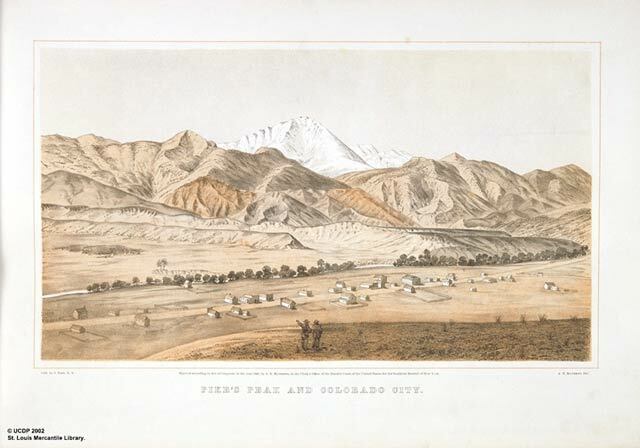 Pike's Peak and Colorado City. Tinted lithograph, Plate 18. Mathews, A.E. Pencil Sketches of Colorado. New York: The Author, 1866. St. Louis Mercantile Library at the University of Missouri - St. Louis. "Colorado City [Colorado Springs] is the county seat of El Paso County, one of the first agricultural counties in the territory. It is located at the base of Pike's Peak, on the Fontaine qui Bouille, (Boiling Fountain) and at the foot of the eastern slope of the mountains. The country in the vicinity of Colorado City is remarkable for its novelty and beauty."